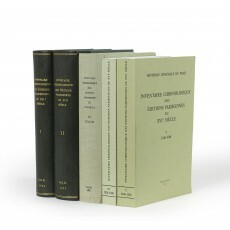 Five volumes (24-25 cm), I (Imprints 1501-1510, 1972): 425 pp. II (Imprints 1511-1520, 1977): 701 pp. III (Imprints 1521-1530, 1985): 681 pp. IV (Imprints 1531-1535, 1992): 471 (5) pp. V (Imprints 1536-1540, 2005): 605 pp. Volumes I-II uniformly bound in collector’s green quarter-morocco, top edges gilt, volume III in publisher’s green cloth, volumes IV-V in publisher’s printed wrappers. 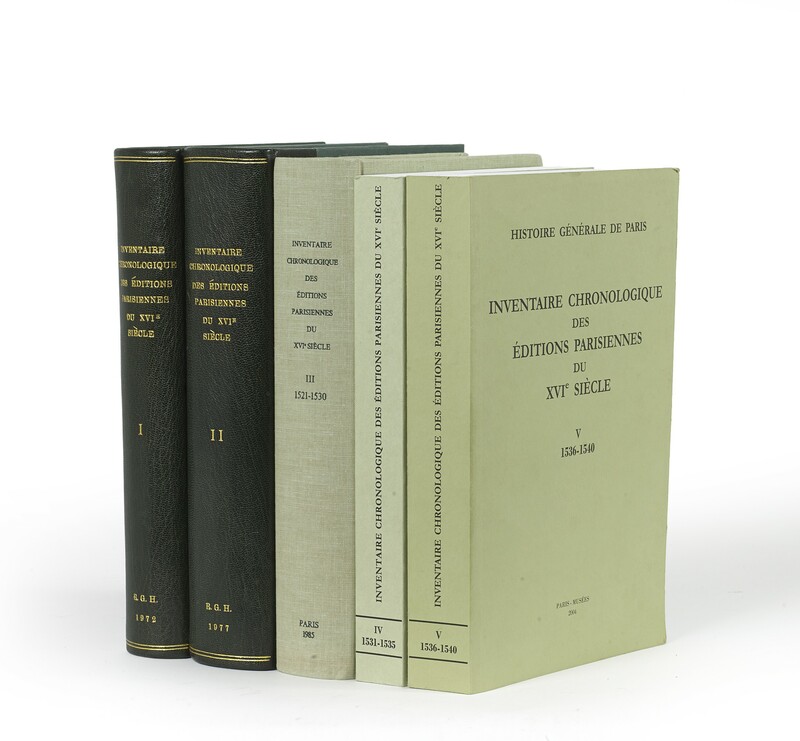 - All volumes published to date of an inventory of Parisian sixteenth-century book production, based on the researches of Philippe Renouard (1862-1934), edited (vols. I-IV) by Brigitte Moreau (1930-1994), assisted (vol. III) by Annie Laskowski, and edited latterly (vol. V) by Geneviève Guilleminot-Chrétien. The detailed entries include a listing of all known copies (abbreviations are given for over 130 libraries in France and over 400 in other countries). Each volume has two indexes: one of authors, editors, translators, etc. ; the other of printers and publishers, including co-publishers from towns elsewhere. ¶ Excellent set. (24 cm), 425 pp. Bound in green quarter-morocco, top edge gilt, a collector’s binding. - 1650 entries, of which 124 are additions to Renouard’s list. ¶ Very good, unmarked copy. (24 cm), 701 pp. Bound in green quarter-morocco, top edge gilt, a collector’s binding. - 2500 entries. ¶ Very good, unmarked copy. (24 cm), 681 pp. Publisher’s green cloth. - 2300 entries. ¶ Very good, unmarked copy. (24 cm), 471, (5) pp. Publisher’s printed wrappers. - 1470 entries. ¶ Very good, unmarked copy. (24 cm), 605 pp. Publisher’s printed wrappers. - 1987 entries. ¶ Very good, unmarked copy.